This is the fourth book about the delightful Flavia de Luce, the precocious young chemist who made her debut in The Sweetness at the Bottom of the Pie. In this volume Christmas is approaching and eleven-year-old Flavia hatches a plan to capture Father Christmas in order to prove once and for all that he does exist despite what her older sisters tell her to the contrary. Meanwhile, much to her cash strapped father's shame, Buckshaw manor is to be taken over by a film crew during the holidays. At first Flavia resents the intrusion, then when an actress is found murdered she is rapidly drawn into a country house murder mystery in the manner of Agatha Christie. There are red herrings and suspects aplenty, plus an interesting cast of minor characters to get to know. As with the previous volumes at times I couldn't help thinking “why isn't someone supervising this kid? !” This time she was running about on rooftops and making her own fireworks, not to mention mixing poisons in her laboratory. But a bit of suspension of disbelief is necessary to let the story work it's magic. Book four lets the reader catch up with the characters from previous books. There are also a few more hints this time around about Dogger's backstory, which I am anxious to hear some more about. 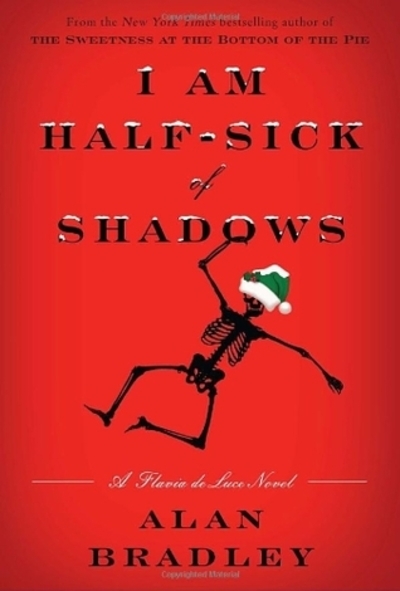 I am Half Sick of Shadows is a fun installment to a charming series, best read at Christmas time for the atmosphere. If you can get hold of it I recommend the audio book version, beautifully performed by Jayne Entwhistle.